Boswell and Books: It's Time to Find Waldo in Milwaukee. Here is your list of stores participating, links to other great indies, and links to the other stores in Wisconsin organizing these searches. It's Time to Find Waldo in Milwaukee. Here is your list of stores participating, links to other great indies, and links to the other stores in Wisconsin organizing these searches. We've got another great July of Find Waldo Local in Milwaukee. 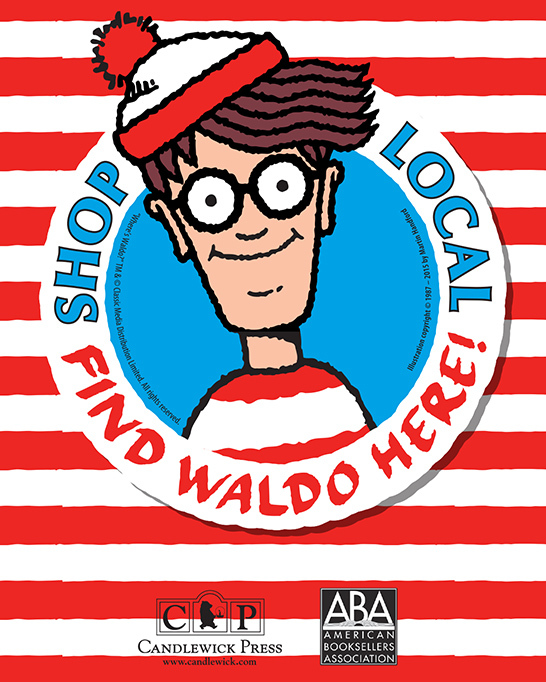 We're partnering with 27 other local independent stores that will challenge Waldo players in their searching skill. Now that we've finalized touches, I feel we should have rated them, like golf holes. We worked hard to find stores that were kid friendly, had regular daytime hours (open at least five days a week, hopefully six), would not be driven crazy by having kids wandering around looking for Waldo (which kind of excluded restaurants), and weren't so small that you'd find Waldo in half a second. OK, we didn't fully succeed on all fronts, but the truth is that the internet has really hurt stores that sell stuff. So that's we why need to find Waldo more than ever. We have friends all over the metro area, but we knew that we couldn't have this go twenty miles in every direction. So for the most part, the stores are bounded by Silver Spring, Oklahoma, and highway 43, though we have a few stores in Tosa Villa, as we had to include Little Read Book, the other general independent in Milwaukee County, and we'd just feel awful if everyone didn't visit our friends at Soaps and Scents. This is Art's first time. This store is one-of-a-kind! Who doesn't love wandering the aisles of Beans? They are our go-to for catering. We've known Gordon and Alicia since they opened across from the Bay View Schwartz in 2005. They've also got locations in Greenfield and South Milwaukee, but it's the Glendale location that's a stop on Find Waldo. Another new addition to Waldo, I have found myself visiting more and more for microphones and cords. Todd says they are the go-to for sheet music in town, and of course I have to give a shout out whenever we do a Lil Rev event, due to their great ukulele selection. A lucky kid on our August 1 party is going to win a starter ukulele! 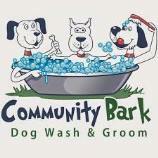 Andrew also has a location of Community Bark in Bayside, but it's the Bay View location that's part of Find Waldo. While you're in the neighborhood, go see a film at the new Avalon and get a treat at Rocket Baby, though not on the game board, two of my favorite places in the View. Everyone should have a real hardware store on their block, right? So many have disappeared, most recently Brady Street, but Dale and his crew are incredibly helpful and sell lots of general housewares. And yes, they make keys. Though not on this year's passport, I'm also giving a shout out to Blifford's in Riverwest. Talk about one of a kind! Sarah and River have a store that should be on anyone's shortlist when showing them interesting things in Milwaukee. And they are opening up a second location too. It's not on the passport but be sure to visit them at 55th and Vliet. This is the company store for the Fyxation Bicycle Company as well as its headquarters. I would not mind a Rishi Tea company store, if anyone is thinking about this. Aside from restaurants and bars and excluding services (like physical therapy), the two categories of "stuff" retail that seem to be vibrant are mattresses and bicycles. The former is explored in this Freakonomics Radio podcast while the latter is featured in Fyxation in Riverwest. Though not on the passport, a shout out to some of our other bicycle friends, Ben's Cycle (outside the game boundaries), Rainbow Jersey, The Bike Fixers, and the local multi-store Wheel and Sprocket. I said we had some exceptions in terms of spaces where it's hard to hide a Waldo, but hey, it's a gourmet popcorn shop, which you sort of can't pass up. Our booksellers just had doughnuts as a treat--how could I not drop off their materials without buying some! Also a pretty small space, and the hours are tricky, as they now close when they run out of their morning batch of donuts, sometimes as early as 11 am (Saturdays). Our suggestion is to start off a day's search with a visit. Especially on a weekday, you'll find it easier to park too! Kids will really find a lot to like in this store, with clothes, collectibles, and art in all price points. Milwaukee is a great chocolate town, but Indulgence really takes my favorite thing in the world to a new level. We've included two locations on the Waldo passport - there's another on North Ave in Wauwatosa. Indulgence's Julie is also president of Local First Milwaukee, so we're not just grateful for her treats, but for her service. Other great places for local chocolate in Milwaukee - Northern Chocolate on King Drive (Fridays and Saturdays only), Kerr's in the Milwaukee Public Market (the Lisbon location is mail-order only), Red Elephant in the Third Ward, Burke's in Riverwest, and Neimann's below. Little Monsters is a very special store for kids halfway between the North and Downer shopping districts. You'll know proprietor Andie from her years at Boutique Bee on Downer. A great selection of kids clothes, toys, and impulse items. It's worth a drive to Tosa Village for a visit to Little Read Book, a charming store, packed with books for adults and kids. You can avoid a little construction (who doesn't like adventure?) by parking in the lot west of the store on State. I parked closer to Soaps and Scents (see below) and walked down. The Downer Sendiks has been completely remodeled, with new freezers. Waldo could be just about anywhere. And parking is easy at the Shorewood Sendiks garage. They're not on the game board but why not visit Nehring's other stores - Groppi in Bay View, V. Richards in Brookfield, and Nehring's in the Milwaukee Public Market? Candy and ice cream? Who wants that? Note that Niemann's opens at 11 am. We've got two locations of Outpost participating in Find Waldo this year. Maria at the Bay View location is particularly excited about hiding Waldo! If you haven't yet been to Purple Door, expect to see even more interesting flavors than you see in your grocery case, but don't worry, 90% of them are kid friendly, and hey, there's not much alcohol in the other 10%. They are not on the Waldo passport but don't forget about Babe's in Bay View, which uses Chocolate Shoppe Ice Cream (from Madison, as does Pizza Shuttle and Chocolate Factory) but makes their own ice cream cakes. Got to support an independent luggage store, and don't forget that kids need luggage too. They also have a nice assortment of backpacks for back to school. For the little metal head in your family? Kids clothes and toys! They also have a location in Mequon. And it's not on the passport, but if you haven't yet visited Ruckus and Glee on North Avenue in Wauwatosa, it's worth a trip. I just spent close to $50 there. Since they were on Downer, I've been a loyal shopper, following them to Mayfair and now Wauwatosa Village. Lots of things for kids too. The former Shorewood staple has moved to Oakland and North, just across from Beans and Barley, and is bigger than ever. Jannis's storytime (formerly at Boswell) has moved there too. And here's a modern twist - no phone but you can tweet them. In general, their hours are 11 am to 7 pm. Not on the passport, but if you like artists collective stores, why not visit Swallow Collective in Bay View. Winkie's is two stores in one! Find Waldo is part of the lower level goings on, which are where most of the kid-friendly toys, crafts, and candy are. This family fun event will take place throughout the month of July and will give players the opportunity to see, taste, and explore Milwaukee in a fun and exciting way. Then come August 1st at 4pm, players are invited to our big prize party at Boswell. Players who have collected 10 or more stamps will receive a coupon and Waldo button. Those who collect 20 or more will then be entered in the prize drawing. We'll have a few categories for folks who can't attend but for most prizes, you'll have to attend to win. Can't find your favorite independent store on the Waldo passport? We're at the mercy of only getting 25 slots from Candlewick, the sponsor, though we're usually able to creatively squeeze a few extra on. We don't charge the stores and thus absorb the costs of the program (the prize for the drawing is voluntary) and so we don't have a ton of time and resources. It's possible your favorite store is a multi-city chain or part of a franchise--we work with all kinds of retailers (hey, we're connected to a Starbucks! ), but for this particular promotion, we're focusing on independents. That said, we know that ownership can be complicated and we might have been wrong about that too--we made at least one mistake! Maybe Boswell is owned by an international cartel! It is not, by the way. Similarly, we work with folks all over the metro area (we just today booked an amazing fall event in Greenfield) but we had to set geographical boundaries on this event. Some stores said no, and others didn't reply to our inquiry. As I mentioned, we were looking for stores open five days a week, were kid friendly, and big enough to lose Waldo. We thought the bustle we caused in restaurants and coffee shops would drive kids crazy. But with all those caveats, it's possible we didn't know about your favorite store. So tell us! 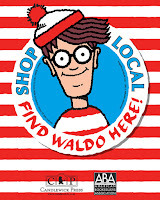 Don't forget, we have lots of great Waldo books to purchase at Boswell. That's sort of the point of the whole deal for the publisher, right? Our thanks to Teasha and Todd at Boswell for putting this together. Now go find Waldo!